This is a reference to textual changes made both by William Godwin (Mary Shelley’s father), and Mary Shelley herself, which make the novel into a composite text. More than this, the Eaton’s copy literally appears to have been cut up and re-bound. As shown below, one piece of publication information has been cut out from one title page, and pasted onto a new page in our re-built book. Like our 1818 edition, this physical object – the artifactual book – is a treasure trove of Franken-history just waiting to be explored. For more info, come back again next week! 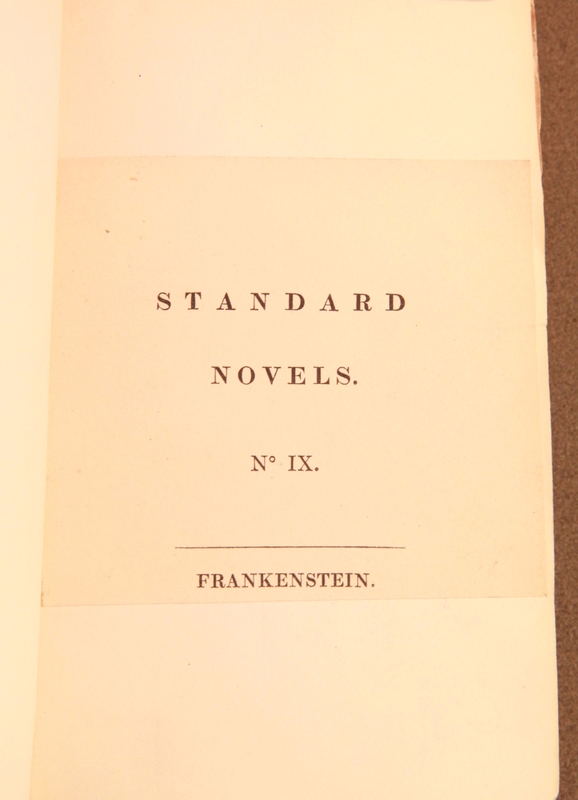 This entry was posted in Editions and tagged 1831 frankenstein, Eaton's_editions, editions of frankenstein, mary shelley, post_by_mb, Seen_in_the_Stacks, The_artifactual_book, william godwin on March 29, 2017 by Jacqueline Jacobson. What makes the Eaton’s Frankensteins unique historical objects? 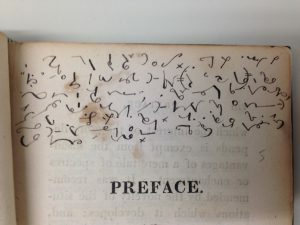 Our 1818 edition (London: Lackington, Hughes, Harding, Mavor, & Jones) contains a personal annotation written in Pitman’s shorthand — a phonetic writing method invented in 1837 and popularized throughout the nineteenth century. 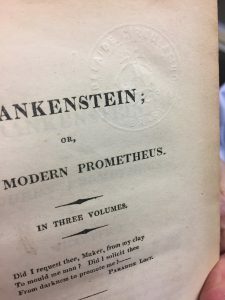 Additionally, though the 1818 Frankenstein was published in London and now is held in Riverside, all three volumes contain embossed library stamps from the “Adelaide Circulating Library,” suggesting that our copy also was held, for a time, in Australia. 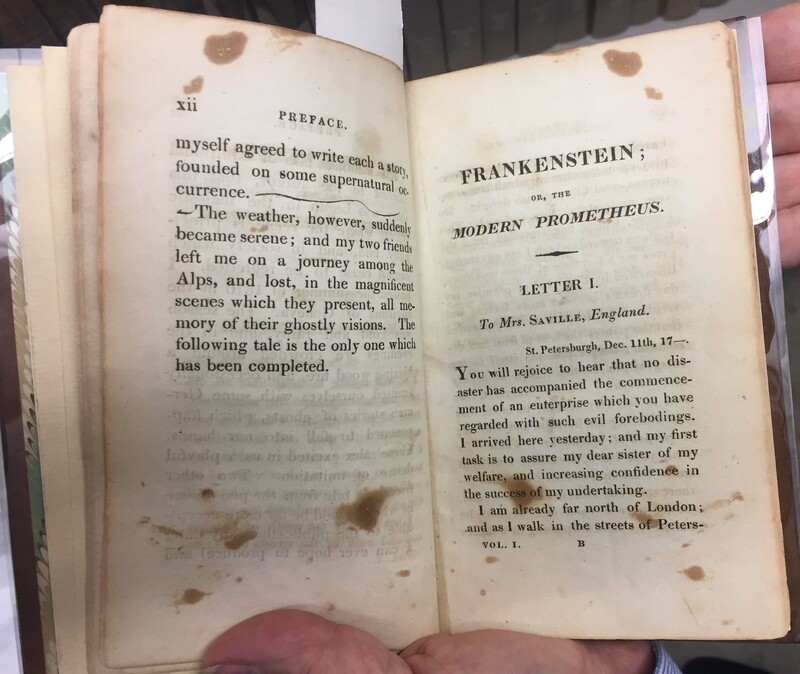 As we build our 200 Years of Frankenstein exhibit, we look forward to tracing these details, which reveal the material life of our books over the past 200 years. 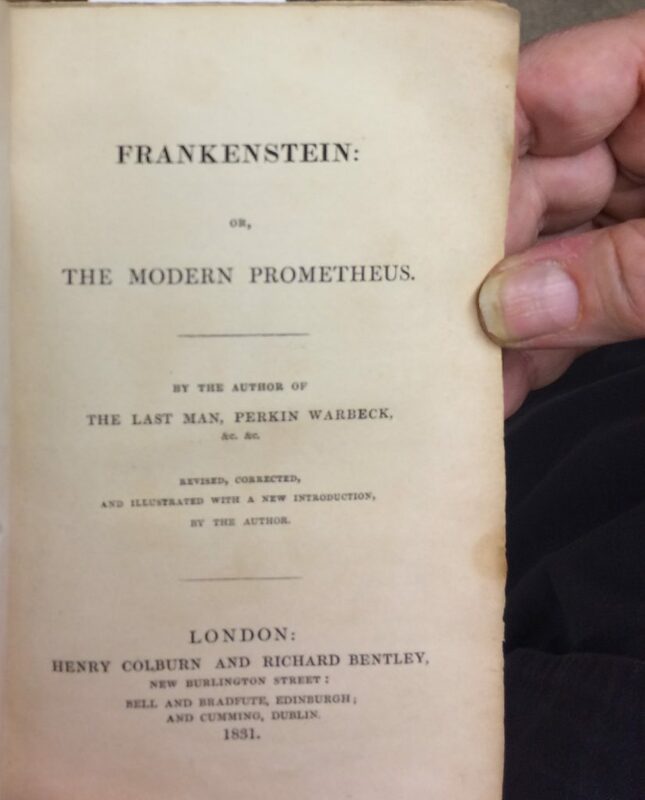 This entry was posted in Editions and tagged 1818, 1818 frankenstein, Eaton's_editions, editions of frankenstein, Seen_in_the_Stacks, The_artifactual_book on March 24, 2017 by Miranda Butler. Have you ever noticed that Victor Frankenstein seems a bit whiny? Perhaps a tad querulous and fretful? Self-absorbed and self-pitying? Peevish? Petulant? Plaintive? Given to kvetching, moaning, bitching, and complaining? You’re not alone. Whether you’re in a book club, school class, or special collections library, it’s impossible not to notice that he repeats words like “wretched” and “miserable” consistently throughout the novel. It’s easy to attribute Victor’s constant complaining to immaturity or hubris, but in Mary Shelley’s introduction to the 1831 edition of Frankenstein, she says that her intention really was to to create a character who could not escape the horrors of his own accomplishment. * As a humorous addition to the FrankenBlog, we have created the Twitter account @whinypantsfrank, which places images of the “whiniest” passages from Shelley’s novel alongside humorous Tweets that highlight Victor’s misery. Click here to follow Whiny Frankenstein! This entry was posted in Editions and tagged book club, humorous, introduction, post_by_mb, reading Frankenstein, whiny victor frankenstein, whinypantsfrank, whinypantsvictor on March 17, 2017 by Jacqueline Jacobson. “A Note on the Text,” in Frankenstein: the 1818 text, edited by D.L. Macdonald and Kathleen Scherf (Ontario: Broadview Press, 1999). “A Note on the Text,” in Frankenstein, edited with an introduction and notes by Maurice Hindle (New York: Penguin Books, 2003). Mellor, Anne K. Mary Shelley: Her Life, Her Fiction, Her Monsters (New York: Routledge, 1989), page 171. This entry was posted in General, Intro and tagged 1818 frankenstein, 1831 frankenstein, mary shelley, percy shelley, post_by_mb, william godwin on March 14, 2017 by Jacqueline Jacobson. The Eaton collection’s extensive archive contains 187 items that feature “Frankenstein” in the title. Though some of these are adaptations, over 50 of them claim to contain Mary Shelley’s original work. But what counts as “original work,” anyway? The Eaton has both a first edition 1818 text, pictured below, originally published in three volumes, and an original 1831 text (third edition), which is printed in a single book. Although scholars have long considered the 1831 text to be authoritative, since Mary Shelley edited it herself, this version also maintains over 100 small changes made by Mary Shelley’s father, William Godwin. What are these changes? Why do they matter? Come back next week for the newest FrankenBlog post! This entry was posted in General, Intro, Uncategorized and tagged 1818 frankenstein, 1831 frankenstein, 200 years of frankenstein, about, frankenblog, frankenstein, mary shelley, percy shelley, post_by_mb, welcome, william godwin on March 7, 2017 by Jacqueline Jacobson. This FrankenBlog, in true Franken-prefix fashion, brings together many stories — how Special Collections libraries come to know their objects and create exhibits, how creative works make their way into our cultural consciousness, and how people from all different backgrounds, living in all different places, come together to celebrate literature that sparks something special in its readers – something so special that a work can be as thought-provoking today as it was 200 years ago. Because there are hundreds of stories you can tell from as rich a collection of Frankenstein material as lives in the Eaton, we don’t know yet which one we’ll explore. Join us as we assemble the body and bring it to life! 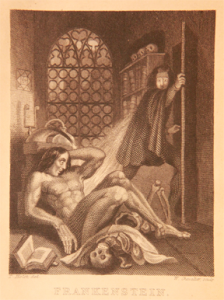 This entry was posted in General, Intro and tagged 1818, 200 years of frankenstein, books, frankenstein, libraries, literature, nineteenth century, post_by_mb, special collections on March 2, 2017 by Jacqueline Jacobson.